President A.P.J. Abdul Kalam today appointed four new Judges and two Additional Judges to the Punjab and Haryana High Court and their appointments have been made effective from the date they assume the charge of their office. The four permanent Judges appointed are: Ripudaman Singh Madan, Arvind Kumar, Derv Daman Anand and Harjinder Singh Bhalla in that order of seniority, a Law Ministry spokesman here said. The Additional Judges appointed for two years are: Aamar Nath Jindal and Mohinder Mohan Singh Bedi. Their names had been cleared for appointment by the Supreme Court Collegium recently. The Punjab and Haryana High Court finally got seven new Judges as seven lawyers took oath today evening. The seven — Mr Ranjit Singh Randhawa, Mr Vinod Kumar Sharma, Mr T.P.S. Mann, Mr Mahesh Grover, Mr Ajai Lamba, Mr Rajesh Bindal and Mr Paramjit Singh Patwalia — were administered the oath of office by the Chief Justice, Mr Justice D.K. Jain. 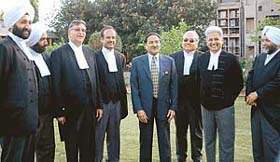 All seven were practising lawyers and their names had been recommended by the High Court collegium in November 2005. However, the oath ceremony was marred by poor arrangements that resulted in chaos, with the High Court officials refusing entry to senior advocates, High Court Bar Association office-bearers and mediapersons. Mr Y.S. Rathore, Special Principal Secretary to the Chief Justice, was seen refusing entry to most people. Mr Rathore even told some mediapersons that there was no need for them to cover the event. Majority of senior advocates and present and past office-bearers of the Bar were seen standing outside the Chief Justice's courtroom as there was no space inside. ‘‘Is this how such an important function is organised? This is probably the first time in the history of this High Court that guests have been ill-treated,’’ rued a senior advocate who was not allowed entry to the venue. This was the not the first time that poor planning affected High Court functions. On March 18, the day the High Court organised a function to mark the end of the year-long celebrations of its golden jubilee, officials forgot to send invites to major publications. Of the new Judges, Mr Patwalia is the son of former Supreme Court Judge Justice Kuldip Singh (retd). He is a designated senior advocate. Mr Randhawa is a former Army officer. Mr T.P.S. Mann's father Piara Singh Mann was one of the leading criminal lawyers of the region, while Mr Vinod Sharma has earned a name for his expertise in civil and company matters. Mr Bindal's expertise is in taxation cases, while the other three are also well-versed in law. Meanwhile, it is learnt that the medical examination of six serving District and Sessions Judges, whose names have also been recommended for elevation to the High Court Bench, has been conducted and their warrants of appointments could arrive next week. They are Mr H.S. Bhalla, who is presently posted as Legal Remembrancer, Punjab, Mr A.N. Jindal, presently posted as D&SJ (Vigilance), Punjab, and Mr M.M.S. Bedi, D&SJ, Chandigarh, from the Punjab cadre. The D&SJs whose names have been recommended from Haryana cadre are Mr Arvind Goyal, presently posted as D&SJ, Panchkula, Mr S.D. Anand, D&SJ, Gurgaon, and Mr R.S. Madaan, Legal Remembrancer, Haryana. The total strength today went up to 34 and is expected to touch 40 once the D&SJs are also elevated. The sanctioned strength of the Punjab and Haryana High Court is 53.